You’ve probably heard several myths about the pulp and paper industry’s effects on the environment. But now more than ever, responsible forestry practices and technological advancements help ensure that no part of the tree is wasted when it’s harvested after decades of growth. At Domtar, much thought and care goes into harvesting our trees. Responsible forestry practices ensure each tree is put to its best possible use to minimize waste. In addition, technological advancements from the last 20 years help reduce waste and maximize yield. Foresters use drones and geographical information systems to monitor growth and ensure cutting waste isn’t left behind in the forest. New “cut-to-length” processing systems cut wood precisely for optimal market value before it even leaves the forest. By the end of 2019, efficiency improvements in the Windsor Mill’s debarking and chipping operations will yield five percent more fiber per acre of harvested wood. 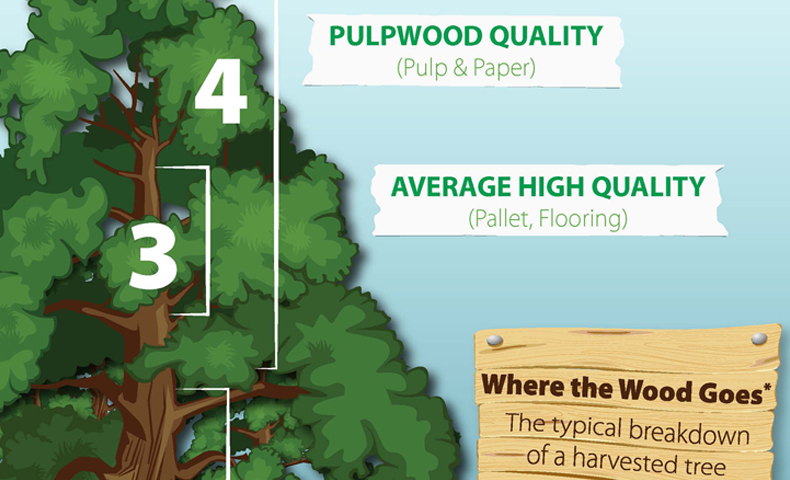 There are four primary categories for harvested trees, of which pulp and paper has the lowest value. The largest-diameter portion near the base of the trunk is the very high-quality wood. It’s used to produce veneer for doors and tables. Moving up the trunk is the high-quality wood. This is the kind of hardwood lumber used for cabinets, hardwood floors, stairs and furniture. Closer to the top of the trunk, you’ll find average-quality wood, which is commonly made into shipping pallets. 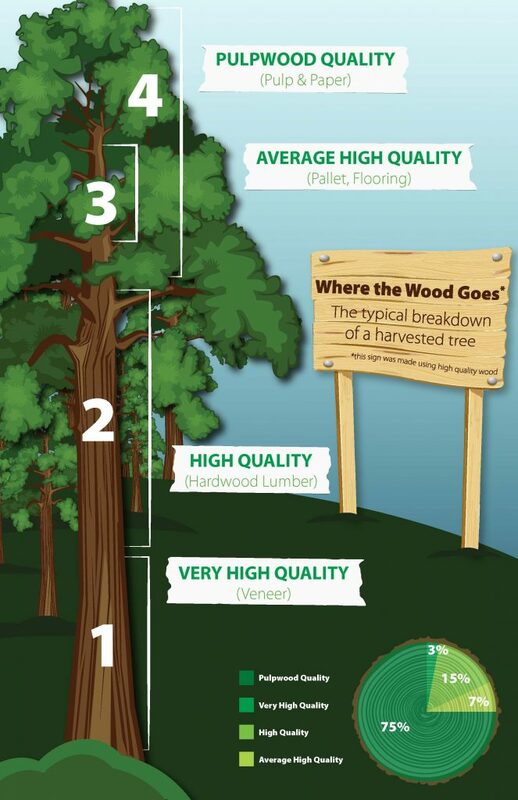 Finally, the top of the tree and the branches are considered pulpwood quality, because — you guessed it — that’s the wood used to make pulp and paper. In addition, Domtar’s pulp and paper mills save the chips and bark left over from the other three categories to produce pulp and paper and to generate power. We put byproducts of the pulp and paper process to good use, too. Lignin — the natural glue that holds wood fibers together — is a byproduct of the kraft pulping process. Traditionally, it has been burned as an energy source for the mill. Five years ago, Domtar’s Plymouth Mill installed a lignin production plant on site to isolate the lignin from the mill’s waste stream. This not only makes the mill more productive and energy efficient, but it also enables lignin to be used in other ways, including as a renewable alternative to conventional plastics and petroleum-based products. The Windsor Mill is even putting its sugar maple trees to work while they’re growing by allowing local maple syrup producers to harvest the sap from the trees. By using responsible forestry practices and looking for ways to improve our processes, Domtar is helping to ensure that forests remain viable for centuries to come.